The proximate cause of the wave of pessimism were two reports on the low levels of house sales in July. 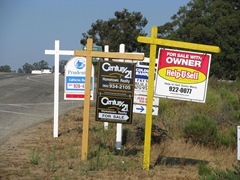 The National Association of Realtors revealed that existing home sales were down 27% in July from June. And sales of newly constructed houses fell 12.4% to a new all-time low. The New York Times reported this with the headline Housing Market Plunged in July, Fueling Anxiety. Anxiety may indeed be being fueled, but the housing market, at least the one most of us care about, did not, as far as we know, plunge in July. As I am getting tired of saying, sales numbers are very important if you are a real estate agent and largely meaningless otherwise. They are analogous to the stock market’s trading volume rather than to a price index like the S&P 500. Alas, I seem to be the only person who can keep this subtle point in his head for very long. Press reports about the data oozed foreboding of apocalypse. US New Home Sales Plunge to Lowest Levels Since 1963 read the AFP headline. US new home sales unexpectedly plunged in July to the lowest level in about half a century, government data showed Wednesday, reflecting the sinking housing sector. July sales broke below the 300,000 mark for the first time in the data’s 47 years of history, baffling most economists who had expected sales to rise to 334,000 units. The sagging sales show that the housing market, which was at the epicenter of the financial crisis that dragged the country into recession, continues to weaken despite attractive prices and record low borrowing costs. To begin with, new houses are not the housing market. The building of new dwellings may be an important industry that employs many people, but new houses make up only a tiny slice of the housing stock. According to the Census, there are about 130 million existing housing units in the US. Moreover, although the article (and many others like it) makes the assumption that a drop in sales can only be due to a drying up of demand, it would be at least as reasonable to suspect a reduction in supply. Housing starts are way down, which is not exactly a surprise. If you were a homebuilder, would you have pulled the trigger on constructing a new house six or twelve months ago? Indeed, things are not as bad for homebuilders these days as you might think. Toll Brothers just turned a quarterly profit. They, and some of their competitors, are using the downturn as an opportunity to buy up land for future use. The reporting on the somewhat less dire sounding existing home sales data also tended to the same unfounded assumption, that a drop in sales can only mean lower demand. The AP headline read Low Prices and Rates Can’t Slow Fall in Home Sales. Mortgage rates are indeed very low, but it is not so clear that house prices are. Certainly, they are lower than they were three years ago, but prices are higher than they were one year ago. Read the article carefully, with a jaundiced eye, and you realize that a shortage of willing sellers is just as plausible an explanation as a dearth of willing buyers. Potential buyers are hesitating because they think home prices still have further to fall. Potential sellers — those with the stomach to put their homes on the market at all, anyway — are reluctant to lower their prices. Real-estate agents across the country are describing a rare standoff in housing markets, where buyers and sellers aren’t seeing eye to eye on price. Breaking the logjam is, of course, very important for real estate brokers, who make money only if a transaction takes place. Who makes the first move does not matter much. If talking up the grave implications of sales numbers will get the sellers to take the buyers’ offers, then that works fine for the brokers. And the very same outfit that brought us the scary July existing home sales number a few days later reported that pending home sales for July, that is, the number of agreements to buy a house that were signed rather than the number of sales that closed, was up 5.2% over June. And just today we hear that the number of mortgage applications to buy houses is now higher than it has been since May. Of course, both these bits of data only suggest that the level of sales, which I do not think means much of anything, is recovering. But they do tend to undermine the dark omen theory of plunging sales. that the "shadow inventory" of distressed properties – the number of homes that are in the foreclosure pipeline but have not yet been foreclosed upon – contracted in July. For five consecutive months, the shadow inventory of distressed homes has shrunk as increases in the mortgage delinquency rate have moderated. Foreclosed houses have been a significant overhang for the housing market. A bank that owns an empty house is a motivated and not particularly subtle seller. It says a lot about the basic resiliency of the housing market that even with all the foreclosures, house prices have been roughly stable for a year and a half now. My view on house prices continues to be that the prognosticators of a second debacle and those hoping for a return to the levels of a few years ago are both bound for disappointment. House prices will be solidly in the boring middle, within striking distance of inflation. We might see a bit of a run up when the economy recovers and the supply of foreclosures finally dries up, but that might be a few years from now. In the meantime, look for the housing anxiety to actual events ratio to stay high. I mostly agree that the new home sales # is not very useful or meaningful compared to total sales. I think the volume of sales can be useful if you look at the whole picture of inventory levels versus sales rate. If you compare the trend of supply and trend of demand that can give you an idea of where prices are probably If you have more and more homes for sale than buyers then that will lead to a buyers market and prices will drift down, but if the opposite is true then prices will drift up. Unfortunately these articles never give us the full picture or much of anything about the overall trends. You would also have to look closer at the houses on the market and how long they’re sitting there. Lets say for example that there are 4M houses for sale and the current buying rate is 4M houses/year. That means there is an 12 month inventory supply. Ok but what if 2M of the houses for sale have been on the market for 2 years and the sellers are trying to do a short sale that the bank won’t approve or are simply asking way too much for the house? That inventory is kind of meaningless so there’s really only 2M of houses on the market that are really feasibly going to sell and compared to the 4M annual buying rate that is a much more healthy figure. This is obviously extreme example, but the point is theres more to the picture than a single number of houses for sale. Ah, I found a decent summary of the monthly inventory, sales volume and median/mean prices. No matter how you look at it the sales in July dropped significantly. Prices are up in the Northeast and West but down in Midwest and South. Did you catch Suzie Orman on Saturday? One of the callers called in and wanted to buy a $107,000 Jaguar XKR. He made $18,800 a month and had $1,800 in expenses including $450 a month in rent. He was going to save up a few months to buy the car even though he had 100 months of living expenses in savings and could easily pay cash. She denied him saying he should buy a home instead. I could certainly see him putting 100k down of a 500k condo and having to sell and netting 450k in 2015. In the mean time he’d be paying $2k more per month for housing. Buying the Jag vs. the condo he could end up with an extra 150k in the bank in 5 years. But, real estate, real estate, real estate still seems to be the mantra regardless of the market or the needs of the buyer. An end to the glut of foreclosures would certainly act to support housing prices, but the recovery of the economy will push hard in the other direction. A proper recovery necessarily means that interest rates will come back up off the ocean floor, and it is well known that housing is a cash-flow calculation for most buyers (multiply your monthly income by .3 or whatever, plug that into the mortgage calculator as your payment, and now you know the purchase price you can afford). Perhaps the net result is just more stagnation. But to me it looks like we are nearing the end of a huge set of government initiatives designed in whole or part to prop up housing prices (homebuyer credits, HAMP, GSE conservatorship…to say nothing of the zero rate).